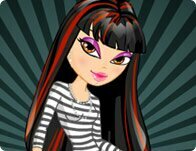 Description: Help this model find the perfect rebellious look. Have fun with funky hairstyles, rock band t-shirts, or unconventional accessories! Instructions: Use your mouse to click on and through the floating hair, clothing, accessory, and background options for this glam punk cutie!